This group of Universals came from Daytona Beach, FL and renamed themselves from the Twisters. 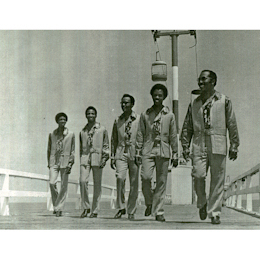 Their “New Generation” has received an enormous amount of coverage on the funk scene over the years, but sadly the original A side of their first issue Expression 45 The Way A Girl Should Be has been totally ignored. This tasteful ballad has always been one that affects me deeply. There’s something about the lead singer’s tone that sounds so right – both emotionally and musically he really hits the correct spot. Great run out groove when the whole song comes together powerfully as well. The self-contained group had several guys on vocals, Alex Morgan who plays the splendid licks you can hear in the background, drummer Aaron Watson, keyboard player and arranger Lindsey Morris and Ralph Sullivan the bass guitarist. Morris gets the voice credit on this track and I’ll take my hat off to him. 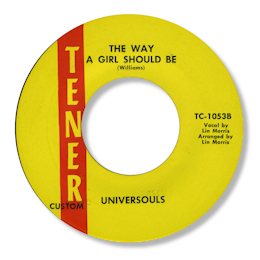 After the Expression 45 lost out after distribution problems, the disc was reissued on Tener but the group’s name was misspelled as the “Universouls”. I rather like that but it seems that the group didn’t. 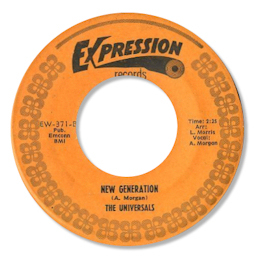 They tried to get something going at Stax after this release but sadly nothing happened for them. What a shame – the talent was clearly there but the luck wasn’t. Note ~ You can find “New Generation” on the Jazzman UK compilation CD “Florida Funk”. Special thanks to Jeff Lemlich whose blog (which you can find here) supplied a lot of the info on this page and who also allowed me to use the fine picture of the group. I’m also grateful to Sean Graham for the pic as well. It was taken on the Daytona Beach Ocean Pier: (L to R) Ralph Williams, Alex Morgan, Lindsey Morris, Aaron Watson, Ralph Sullivan.